As Hurricane Sandy wages her wrath across the eastern coast of the US, a handful of America’s finest stare right back into the deep, cold, and dark eye of the storm. The Name is Unknown but Never Forgotten! Why do we guard a tomb, when there are plenty of living folks that could use additional security? Why do we guard a tomb of one, specific, fallen soldier – when there are so many throughout our history left unguarded? Why is that specific fallen soldier whom we’ve guarded non-stop for about 65 years nameless to the rest of us?! Like so many things in life, friends, the answer is in the question! “Why?” indeed! For longer than most of us have lived – for longer than most of the guards themselves have been alive – we have protected something bigger than an individual. We’ve guarded a principle. It is sometimes difficult to stand for a principle when there is a name attached to it. The name of the soldier is unknown, and because it is, it makes the principle that much more well-known! What can be Learn from this “Stand against Hurricane Sandy”? 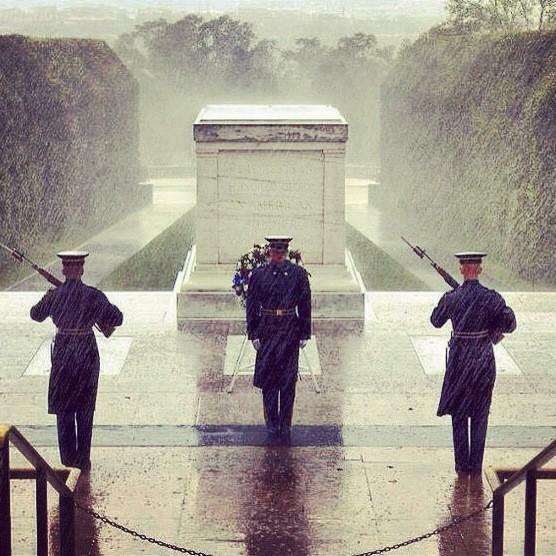 Some may call the continued ‘guarding of an unknown soldier’ during a life-threatening storm reckless. Perhaps, but there is a VERY thin line between recklessness and resilience. They stand for a history that will remember the fight of an unknown soldier long after their own names have been forgotten. So, what can we learn from soldiers guarding the tomb of an unknown soldier… as they face a threat which is 100% resistant to the firearms they march with? We can learn, and/or remember, what it means to be a part of something greater than ourselves; to contribute to something more than ourselves; to overcome our own mortality in the commitment of an undying statement. Today let’s remember that some of humanity’s bravest warriors never need to fire a round. Indeed, sometimes waging a war does not require raising an arm. To the guards at the tomb of the Unknown Soldier, I say: thank you for your service, your commitment, and your resilience. Fight on & God bless!! To do my small part to propagate ‘truth’, I do want to highlight that the picture of the guards which went viral (and is included in this post), was apparently taken in September, before Hurricane Sandy struck! That said, I think the story itself is a refreshing reminder of certain causes which are so easy for us to forget/take for granted in our hectic day-to-day lives! To me, the message is in their stand, and not the timestamp of their picture! Previous Previous post: Inspired by: an Animal Instinct! Next Next post: Inspired by: Being Yourself 364 Days a Year!